I saw it from across the Salvation Army store. It was 2009, early in my thrifting game, so I did not know a lot about the designer I had just stumbled across, but I knew I was looking at something special. And guess what? The 100 percent wool beauty made in Belgium was on the $2 rack. I still pinch myself that I thrifted a Raf Simons coat for what I would spend on a pack of gum. Needless to say this jacket is worth a heck of a lot more. It’s a men’s coat but we thrifters never play by the rules. Raf Simons is a fashion industry giant who ended his tenure at Calvin Klein last year. Before that he had successful stints at Jil Sander and Dior. He collaborates with Adidas and makes really funky (read: expensive and highly sought after) sneakers. Researching the label was one of the first lessons in paying attention to the designers behind the fashion. 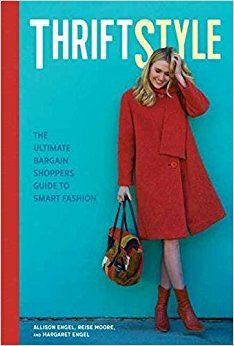 With thrifting you get to shop humanity’s closet, but if you really want to slay the thrift hunt you should understand the keys to quality: designer, fabric, construction. It will keep you from junking up your closet with sub-par clothing that will fall apart and disappoint. This coat is a forever piece for me and seeing how my daughter is already eyeballing my closet, I hope she will love it one day as well.